Our telephone system was down briefly this morning; this has now been resolved. Please accept our apologies for any inconvenience caused. 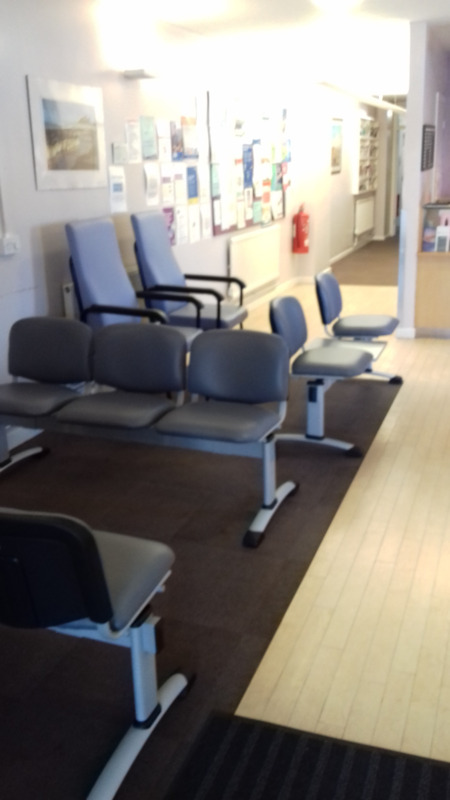 Thanks to Section 106 funding, we have been able to replace our seating in our downstairs waiting room. 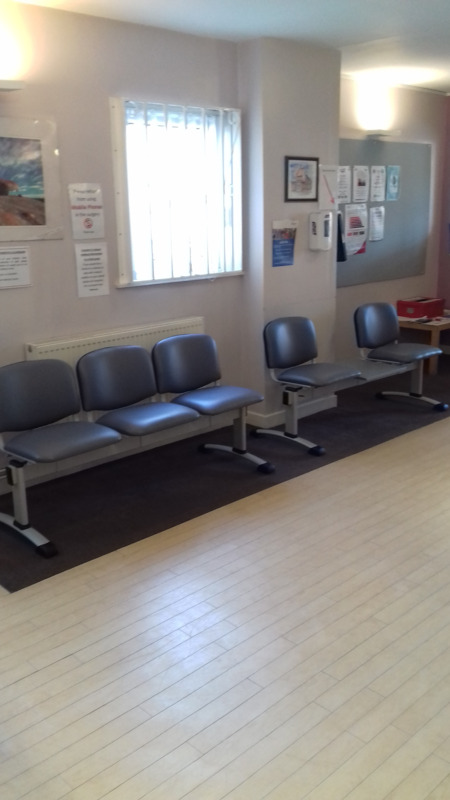 It has also funded a waiting room blood pressure monitor for our patients to use. Your BP reading will be printed out. Please write your name and d.o.b. on the slip and pass it to a member of our Patient Co-ordination team on reception. They will then ensure this is added to your medical record. A chair will be provided and a privacy screen will follow soon. N.B. Can we please ask parents with small children, to ensure they do not allow their children to play with this equipment. We would like to welcome Anita Rumming to our team. Anita has 11 years experience of working in General Practice and therefore brings a wealth of knowledge with her. Join the NHS England Young Carer Health Champion programme in July 2019! Individuals who have been patients or carers of patients at any of the UHL hospitals of Leicestershire and Rutland such as the Leicester Royal Infirmary, Glenfield Hospital, Leicester General Hospital or Loughborough Hospital. They have volunteered to put forward the patients’ points of view about treatment with the intention of improving the quality of care, treatment and respect for patients from the medical, nursing and administrative staff of the hospitals. National charity Contact the Elderly is launching a new tea party group for isolated older guests in Quorn, and is looking for more guests before the group can launch. The group is for guests aged 75 and over, who live alone and struggle to get out or have become a bit isolated for other reasons. Guests are collected by the same volunteer driver each month and taken to Sunday afternoon tea in a volunteer host’s home, giving people who would otherwise have been on their own the chance to have a cup of tea and a lovely chat with friends. The group is still looking for older guests so if you, or anyone you know, could benefit (or if you would like to volunteer) please see here www.contact-the-elderly.org.uk or contact chloe.brown@contact-the-elderly.org.uk for more details and help brighten someone’s day! If you require more than a 10 minute appointment, e.g. if you have more than one problem, and 2 consecutive 10 minute appointments are not available online, please contact reception. Monthly heritage and wellbeing get togethers for the over 50s, at risk of or experiencing loneliness/social isolation. Did you know that you can register for online access? This service gives you more control and is really easy to use. So far we have 1689 patient registered for this service.. It enables you to make appointments, book prescriptions and to view a summary of your medical record. Please ask one of our Patient Co-ordinators for more information. We are currently experiencing problems with our Text Reminder Service. This is being looked into by our Clinical Software Provider and we hope that this will be resolved soon. In the meantime please make a note of the date and time of your appointments to ensure attendance. Please CLICK HERE to read the update. Patients between the ages of 55 - 59 are now being invited to attend for Extended Scope Bowel Screening. This is in addition to the existing test for 60 - 74 year olds, where patients send 3 x stool samples, after receiving a kit through the post. The appointments are likely to be at Loughborough Hospital & will be sent out via NHS England. If any patients wish to opt in, please call 0800 7076060. We will update this page if/when we receive further information about this service. WHY AM I ASKED THE REASON WHEN I REQUEST AN APPOINTMENT? The Receptionists are advised by the GPs’ to ask for a brief description of the reason when you request an appointment. They are highly trained to direct you to the most appropriate healthcare professional for the required length of time, in order for you to receive the best possible care. This also helps the clinician to prepare any special equipment or information needed prior to your consultation, preventing unnecessary delays to other patients. All staff at Quorn Medical Centre are bound by confidentiality. We are committed to working together to ensure that your experience of us is a positive one. WHY DO SURGERIES RUN LATE? Each GP appointment is 10 minutes long. However some patients attend with very complex or multiple problems, some of which are deemed too serious to be postponed to another day. Additionally if a patient needs admitting to hospital, this can also cause delays, as the GP liaises with the hospital, which usually involves waiting for several telephone calls, whilst monitoring the condition of the patient. Our Nursing team also experience delays in their clinics for many reasons; Sometimes GP’s ask for blood tests or ECG’s to be performed urgently, a patient could faint during a procedure, or the nurse may need to seek advice from a GP immediately, regarding a patient’s health or test result. Children or distressed patients may be seen earlier to avoid further distress. A white board is displayed behind the reception desk, advising patients of approximate waiting times. This is updated regularly by the reception staff. *If you have more than one problem or if you think you will need longer than a 10 minute appointment, please ask for a double appointment. *Give yourself plenty of time when making appointments, to allow extra time in case of unexpected delays. *Please be patient & considerate to staff & other patients, one day it may be you that needs that extra time. WHY DOES IT TAKE UP TO 3 WORKING DAYS FOR A GP TO SIGN MY PRESCRIPTION? The surgery receives hundreds of prescription requests every week. These include individual request slips, batches from chemists & care homes, online prescription requests, postal requests & new medication from hospital discharge letters. Most repeat prescription requests are straightforward & can be processed fairly quickly. However, if a medication review is overdue, the GP will need to check the patient’s medical record to identify any tests or action needed to complete the review. Additionally any medication changes & new medication from hospital, have to be monitored closely & may take a bit longer for us to implement. *Please allow us at least 3 working days to process your repeat prescription. This is particularly important if you are going on holiday, or if the surgery will be closed due to a bank holiday. *If you would like to register to order your repeat prescriptions online, please ask at reception. * Please note we are unable to accept repeat prescription requests over the telephone for safety reasons. WHY CAN’T YOU TELL ME MY 16 YEAR OLD’S/HUSBAND’S/WIFE’S/ELDERLY PARENT’S TEST RESULTS? All staff working in the NHS have a legal duty to keep your medical records confidential in accordance with the data protection act 1998. Therefore, we are unable to disclose any medical information to a third party regarding a patient over the age of 16 without their prior permission. This may seem unfair to you as the person who arranges & drives them to all their appointments, But under no circumstances can we assume that consent to release medical information or test results has been given without written authorisation from the patient. *If you wish to nominate a third party to receive medical information or results on your behalf, please ask at reception for a ‘Consent to release medical information’ form. * Consent can be given for limited information if preferred, & can be withdrawn at any time. If you have tried to quit smoking before and you were not successful, then Quit Ready Leicestershire can work with you to find a more appropriate and more successful way of quitting. Advisors from Quit Ready Leicestershire will contact you via telephone, text message, web chat or email, offer support on a weekly basis during the 12-week programme to ensure people have the best possible chance of staying smoke-free. The service runs from Mondays to Fridays (9am to 7pm) and on Saturdays (10am-2pm). Please note if you use a Smoking Cessation Service you are 4 times more likely to succeed in quitting. If you would like help in giving up smoking, contact Quit Ready Leicestershire online at www.quitready.co.uk or by phone 0345 646 66 66 or text ‘ready’ to 66777. You may be eligible for free shingles vaccination this year. Please ask at reception. From the 1st April 2015 NHS England introduced a contractual requirement of a named GP for all patients. These new arrangements do not prevent you making an appointment or seeing any doctor, of your choosing within the surgery, as you would normally do. Call 01509 263151 on weekdays between 8.30am - 5.00pm (4.30pm on Fridays). Call 01509 634567 at any other time. Please do not provide samples in glass jars/bottles as we are unable to dispose of these. Thank you. Please note we no longer offer this service. Patient Access is now available to download as an app to your Smartphone. This will enable you to book appointments and prescriptions, providing you have a connection to the internet; this is a 24 hour service. Please see the appointments field on the left, for a link to the download page. Did you know Quorn Medical Centre is on Facebook?? 'Like' our page to get useful information about the surgery and to find out about or Patient Participation Group (PPG)and how YOU can get involved and help us to help you. Please note the 'comments and suggestion' field in the 'Contact Details' option should not be used to request prescriptions or to make complaints. If you are between the age of 40 -74 you will be invited for a free NHS Health Check to assess your risk of developing Heart, stroke, kidney disease and diabetes. However, please note, if you are already being treated for these conditions you will not be invited as you will already be under our care. If you experience any problems with our loop system, please inform reception. When attending the surgery, if you have or suspect Chicken Pox, please report to reception in we need to isolate you from other patients. Please note that specimen samples brought in by patients, that have not been requested by their GP, will not be sent off for testing. Please ensure that you write your name and date of birth on all sample bottles. Any sample pots without patient details written on them, will be disposed of without testing. Thank you for your co-operation. Hearing Aid Batteries - These are available free of charge from reception.